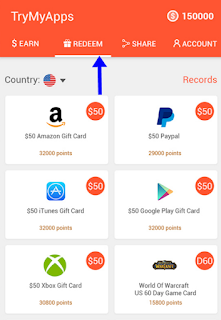 How to Make PayPal Cash, Money And Gift Cards with TryMyApps? Have you ever thought to make money online hard? Like a lot? Well, what if I told you've thought wrong? Yeah, well that's what I'm going to talk about in this piece - how to make money with TryMyApps. 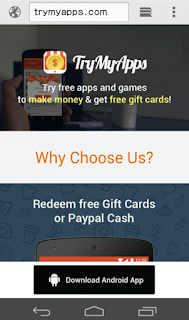 TryMyApps is awarded as one of the best apps to earn money and gift cards online. Now, read the following parts to learn how to make money with this app. 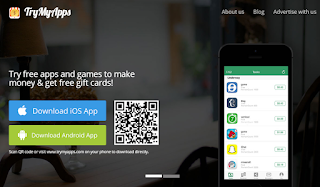 What You Need to Make Money with TryMyApps? Do you need a PhD. in Marketing or SEO or anything to make money with TryMyApps? Nope! It is the part that I liked most, all you need to know is how to "download" app. Do you need high-tech devices to make money with TryMyApps? Nope! Just an Android device will do! 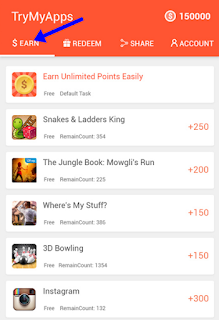 How to Make Money With TryMyApps on Android? 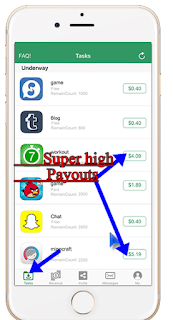 Making money with TryMyApps is probably one of those "easy money" tricks that are too good to be true. But the only difference is, these "actually" are true! So here's what you need to do! (Trust me, they don't ask you to stalk someone on Social Media or something!). Just head over to TryMyApps.com on your Android device. Download and install it on your Smartphone. Now head over to the "EARN" sections! That's where the magic happens! I mean, that's where you'll be able to do whatever it is you have to do to make money with TryMyApps. So on the Earn page, you see those apps, right? Guess what, all you have to do is to download them! Well or in some cases, download and "use" them for any particular time-period. So that's how you make money (or points, which you can redeem for cash or gift cards. I'll show you how) on TryMyApps! How to Make Money with TryMyApps on iOS? Got an Apple device? Worry not, TryMyApps has it reaches almost everywhere. (Okay that's just a phrase, don't stress over it too much). You don't need to do something very special in this case either. In fact, I'll make this extremely easy for you! Just head over to http://www.trymyapps.com/ and you'll see a screen like below. Just scan the QR code using your Smartphone's Camera. This will directly download and install TryMyApps on your iOS Device. Or, you can go to TryMyApps.com to separately download the application. Anyway, the point is, once you get TryMyApps on your iOS device, you're almost done. Now, you'd receive tasks. Nope doesn't worry; they're simple, just like before you receive "keywords." Which you have to "search and download'. Or you can directly check the "tasks" section out. So once you get the applications, just complete the tasks! (Which either will be to "download" the application. Or download and use it!) In either case, nothing very hard, right? Just download the apps, and complete the tasks. Upon completion, you'll get paid whatever amount the job was worth for! What to Do With Points? Or How to Withdraw Money? Worry not, now you've points and money in your account, right? Is it any use to you? It is! There are some ways that TryMyApps has made possible for you to use so that you can withdraw your money, like into REAL CASH! See? You can either use it as a Gift Card and buy something from Amazon, Google Play or any other service. Or can get it directly as "money" in your PayPal accounts. If you have a smartphone, Android or iOS, it doesn't matter, and you aren't allergic to money. I seriously don't know why you might not want to try TryMyApps out. After all, what does it cost? 0.00$, right? It's totally free! And it's paying you just to download and use the applications. And the best part? Those applications are pretty neat and useful too. I mean they don't ask you to download "videos mobile app" for instance. The applications are photo editors, games or stuff like that, stuff which will make your smartphone attractive, better and make you some money in the process. So well that was about it, that's how you can make money on TryMyApps! Give it a try right now buddies, or regret later your choice.